I haven't done any modelling of late, so it's time to get back in the saddle. I figured I'd continue along the line of adventures past, and go with some more 40K sheet metal. I decided on a Leman Russ, although it seems like there are a gazillion variants of it these days, so mine may end up being something of a mashup of whatever bits I like best. The basic hull will be along the lines of a Mars Alpha pattern, which is slightly longer than a normal Russ, and has all sorts of extra engine gubbins on the back, hanging out in the breeze (seems logical for an AFV). Needs a bunch more return rollers up top, and at least one more road wheel I think. 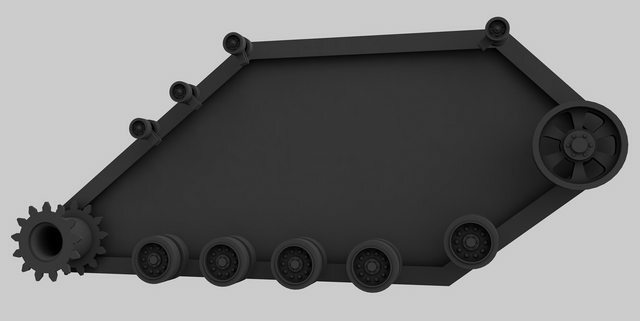 I'll probably need to add in some sort of external transmission housing for the drive sprockets, seeing as based on the model the tracks would appear to be driven by a daemon on a treadmill with no external mechanical inputs. I figured I'd try and make it at least a tad more realistic than the Baneblade, although not too much naturally - that way madness lays. very much a world war one type of design. Yeah a number of the 40K tanks are based on the British WW1 tanks. I've been playing around with the tracks. I'm not super keen on the ones the GW model uses (top of pic below, missing grip plates). Far too chunky to actually be practical. I figured I might go for something closer to a real tank. I thought maybe the Mark IV style, but it's a bit plain. I want something that looks like it has a bit more bite. Bottom of the pic is something loosely based on some Jagdtiger tracks. the second design, those based on the jagdtiger, are better by far, more detail hence better to look at. they are not hugely similar to the jagdtiger but there is some resemblance, i am quite familiar with that tank having seen a few examples of it myself. looking at the top set of tracks i think there is a nice shape to them and actually if each link were compressed to become maybe half or a third of it's current length and then some ridges added they could be an effective design also, taking details like you put on the bottom tread set and applying them to a compressed version of the top tracks would be very cool. 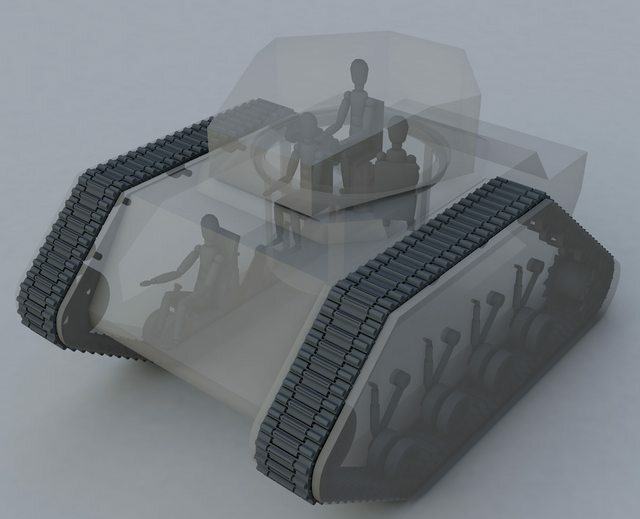 another tread style you might want to consider is that of the churchill tank, it was originally envisioned with the idea of fighting in an environment with heavy use of trenches so bears some similarities to world war one vehicles. p.s. for a far future design i'm surprised the armour is not sloped. for a far future design i'm surprised the armour is not sloped. Yeah pretty much all of the Games Workshop stuff is Rule of Cool/Form Over Function. The concept artists come up with a design based on a particular race/army theme, with seemingly little thought to how it might work in practice. This is especially true of vehicles, where most of them have no provision for mechanical functionality like drivetrains and what have you, or considerations of things like adequate protection. And there are also concessions for manufacturing the model kits, and repurposing components between multiple kits. The Imperial Guard, who use the Leman Russ as their MBT, are themed after 19th and 20th Century armies. Their armour is mostly styled after British WW1 designs, and their infantry is a mix of various European influences from the Napoleonic era through to the Soviets in WWII. They are all about massed waves of mediocre infantry and armour, as opposed to the Space Marines, which are elite super-humans of finite supply, focussed on precision strikes. The sledgehammer vs the scalpel. The fluff is that the humans of the 41st millenium are in a technological dark age, and are simply using what advanced technology they can salvage from the past. They are mass-producing designs based on old databases they have surviving records from (STCs - more info here and here if you are interested). They have little to no ability to manufacture new designs. It doesn't actually make any logical sense of course, but as I alluded to in the first post, you don't want to dig too deep when it comes to the fluff of 40K. looking at the top set of tracks i think there is a nice shape to them and actually if each link were compressed to become maybe half or a third of it's current length and then some ridges added they could be an effective design also, taking details like you put on the bottom tread set and applying them to a compressed version of the top tracks would be very cool. another tread style you might want to consider is that of the churchill tank, it was originally envisioned with the idea of fighting in an environment with heavy use of trenches so bears some similarities to world war one vehicles. 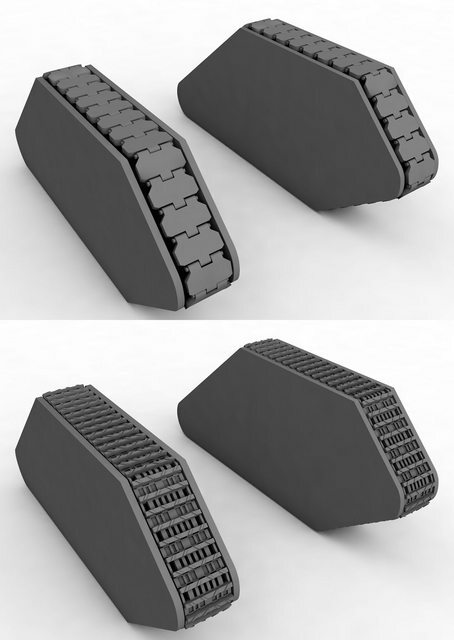 As I mentioned in the previous post, I didn't add any grip blocks to the GW tracks, which is why they are bare. I just knocked the basic shape together quickly for reference purposes. Here's one example of the physical model, if you are unfamiliar with it. Yeah the Churchill tracks do have a pleasant meatiness to them. Thanks for the suggestion. Not sure how to rationalise the ammo storage/loading system yet. 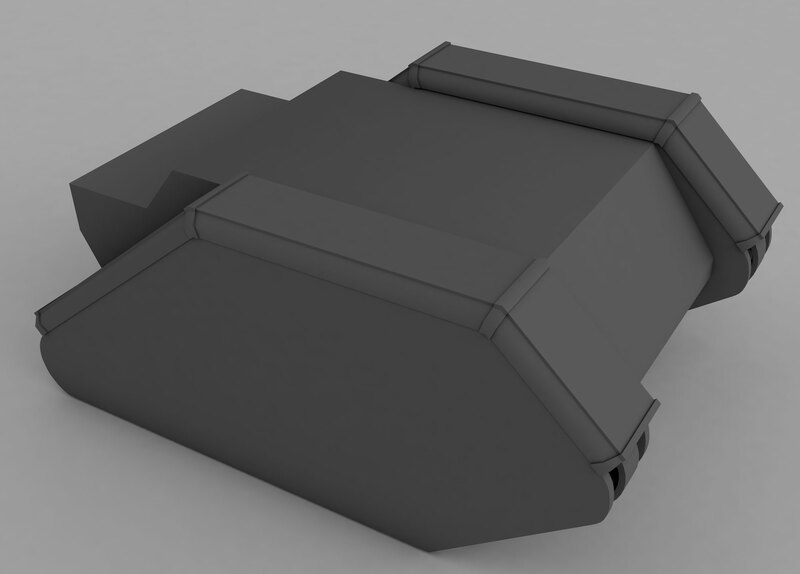 That will dictate how the turret should end up. Originally I was toying with a couple of different loadout options, but I probably need to settle on one and build the turret around that. Edit: Actually, now that I think about it, I'm wondering if a Soviet-style autoloader may be the go. There is a shed-load of room under the basket that would probably be wasted anyway. Mght as well stick a carousel in there. As a bonus, it potentially gives you turrets firing off into space, which seems fairly appropriate for the Imperial Guard.